The BMW X7 press drives are just days away, but ahead of those, BMW of North America has invited us to Palm Springs to sample an entire fleet of new models, and to ride in some of the upcoming ones, like the X7 shown below, and the all-new X3 M and X4 M.
The ride and driving impressions won’t be out until late March, but for now, you get to enjoy some images of the X7 going off-road at The Thermal Club. As we’ve seen in the past, the X7 is not just the largest BMW SUV to date, but also a quite capable off-roader. We took a prototype X7 on an off-road back in the Summer of 2018 and we came back impressed at the time. To “compete” with the true off-roaders, the BMW X7 actually gets an optional Off-Road Package. The pack comes with skid plates, hill descent control, an electronic differential lock and a functional underbody cover. 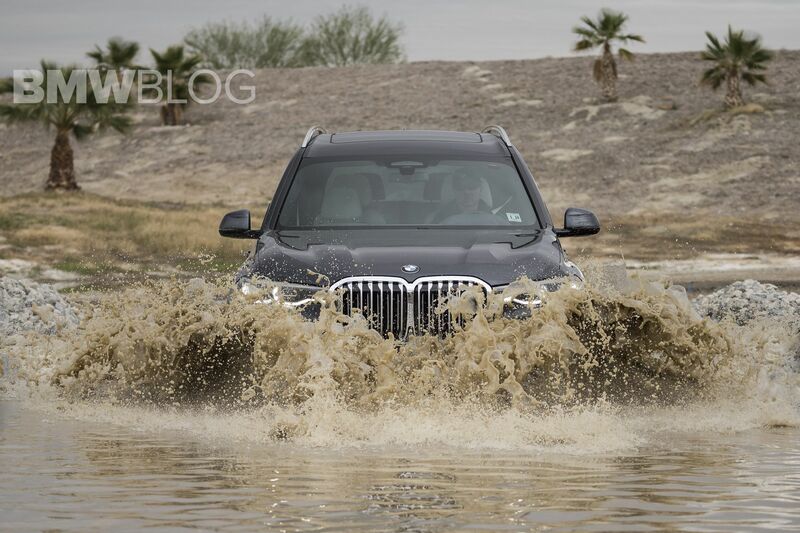 BMW seems adamant that the X7 can handle itself, moderately, on some rough terrain. With four new driving modes – xSand, xGravel, xRocks and xSnow – the X7 will be able to take you through different terrains with a touch of a button. As seen below, the X7 not only was able to handle some seriously uneven terrain, but also go through deep waters. It’s unlikely that many, if any customers, will subject their X7 to such extreme treatment, but it’s comforting to know that the combination of an experienced driver and the X7 can get you out of some tight situations.